I owe a great debt to Makoto Shimizu. 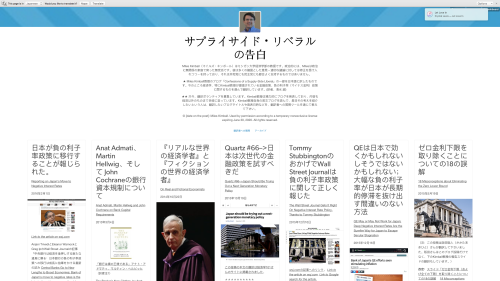 Without any compensation, he has maintained the Japanese language version of this blog–including arranging for translations and doing the bulk of the translation himself. I know that Makoto does this because he believes as I do that appropriate negative interest rate policy is the way for Japan to escape its version of secular stagnation and for other nations to avoid falling into secular stagnation. Hi, Miles. Most of the responses in the Japanese media to BOJ’s negative interest rate policy including from academic economists were negative as I anticipated (and I guess somewhat you may, too). Soon after the BOJ’s announcement and before reading your post “The Bank of Japan’s New Tool to Block Massive Paper Currency Storage,” I had a meeting with the former Deputy Governor of BOJ (2003-2008), Kazumasa Iwata at the Japan Center for Economic and Research. Now he is the president of the center, and the most active supporter for the negative interest policy in Japan as far as I know. In the meeting, I talked about negative interest rate policy with him and other staff members at the center. One thing I pointed out related to the effective negative rate on cumulative cash withdrawals that you wrote about was that it would promote negative interest rates on private deposits since the private banks would try to influence any cash withdrawals their depositors made. At the time, took the BOJ statement to refer to “cash holdings.” Then, Ikuko Samikawa, a staff member pointed out that it is hard for the BOJ to know the exact cash holdings in the private bank since there is no distinction between cash and other cash equivalents in the financial statement. So it will be difficult for the negative interest rate to “apply only to a bank’s own holdings of paper currency.” Kazumasa Iwata said what the BOJ does would be to monitor the net cash withdrawal at the cash window. I think this was similar to what you argue in the post. After the meeting, I made an inquiry through the Bank of Japan’s website BOJ about this paper currency policy. Takuto Ninomiya of BOJ answered me. He said something like: “There are no exact figures in the scheme so far.” He also attached a file giving an official statement saying the same thing. So it does not sound like a policy “rule.” The Bank of Japan seems to be making a vague statement–maybe even a bluff–to discourage private banks from withdrawing too much paper currency. On reflection, I think the effective negative interest rate on cumulative net paper currency withdrawals from the cash window is similar to a withdrawal fee at cash window since the banks face a negative interest rate for cash that would prevent a profitable arbitrage of borrowing to stock up on paper currency. However, an effective negative interest rate on cumulative net cash withdrawals is better than a withdrawal fee since the payment is more appropriate. Although the scheme is similar to the deposit fee you propose in having an appropriate payment for additional cash withdrawals, it doesn’t cover cash already in circulation.